St. John?s in the Wilderness and more. 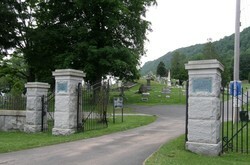 A knowledgeable guide will board the bus at each stop, presenting the history of each cemetery. In addition, we will learn about some notable people buried at each cemetery. Although we will be disembarking at two or three cemeteries, these stops will not involve a lot of walking. * This trip will conclude with lunch at a local restaurant ? Union Restaurant, Mariella?s, or Terrace on the Hudson (we?ll let you know which one before?the trip) ? and a return bus ride to the Haverstraw Village Parking Lot, located at 40 New Main Street, across the street from Haverstraw Village Hall. The 2016 History in Your Own Backyard series has been made possible by generous contributions from Central Presbyterian Church, the Town of Haverstraw, and the County of Rockland/I Love NY. Bus leaves Haverstraw Village Parking Lot ? 40 New Main Street, Haverstraw ? 8:45am SHARP. Includes bus transportation, tours and lunch at a local venue. * Our bus tour will travel to sites of several historic and well-known pipe organs, including St. Peter?s Roman Catholic Church, Central Presbyterian Church, Trinity Episcopal Church, and more. FOR INFORMATION ABOUT RESERVING SEATS FOR THE NOVEMBER 19 TOURS, CLICK HERE. Or contact us by phone at (845) 634-9629 or by e-mail at?info@RocklandHistory.org.